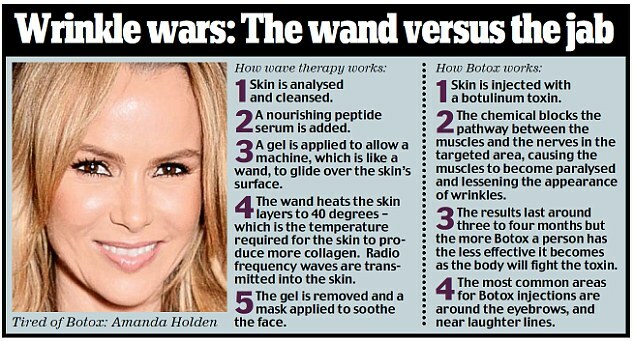 Collagen wave therapy is a new cutting edge form of energy-assisted skin tightening therapy, using the computer-controlled application of radiofrequency energy.to treat loose skin to the face and neck forehead, around the eyes, cheeks, mouth and jowls without causing any damage to any of the delicate areas nearby. At last a realistic alternative to the surgical face lift. For years, it has brought smiles to the faces of Britain’s celebrities – not to mention the odd permanently startled expression. But it seems that Botox’s days as the wrinkle-removing treatment of choice could soon be over. Instead, growing numbers of the rich and famous claim to have found a new way to turn back the clock – without ending up with that tell-tale frozen stare. X Factor judge Miss Brown, 39, said: ‘I’ve been having it for a few months and my skin has never looked better. 'I don’t want to have Botox or surgery because I want to have expression in my face. But I want to look after myself.